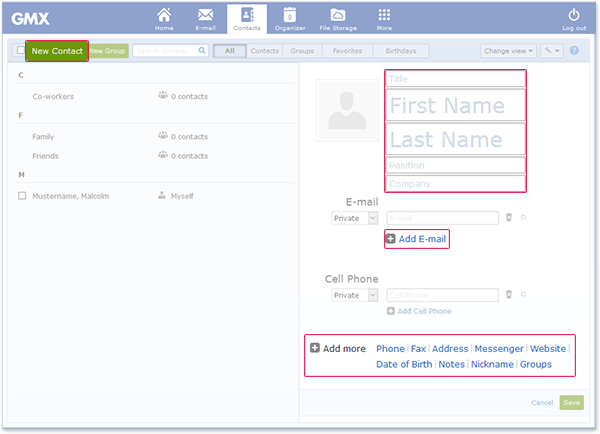 Add your friends or colleagues to your Contacts and manage them through the GMX Contacts. If required, you can add more fields. Open your Contacts and click the New Contact button in the top left corner. On the right, enter the name and any other data required by clicking the field in question. Click Save to confirm. Enter an e-mail address and a telephone number, where applicable, by clicking the field in question. Click Save to confirm each entry. If required, you can add more fields. To do so, click the link in the Add more line at the bottom, and enter the appropriate value. Click Save to confirm each entry. The contact has been saved. To supplement or correct the contact later, you can edit the contact.